A few years ago, Kyle Busch had an image. After dominating the Camping World Truck Series with Billy Ballew Motorsports, the Las Vegas-native ventured out and opened the doors to his own organization. Since then, the Toyota-powered team has been one of the strongest in the Truck Series, and the future is looking even brighter than one could imagine. In 2014, Busch went to Victory Lane seven times, and he had an average finish of fourth in 10 races. However, there were a few key additions to this team that have madeKBM not only a contender for the owner’s title, but for the driver’s one as well. Last season, the team had two full-time drivers with a third truck that was split among four drivers, including Busch. One of those full-time pilots stayed with the team for the 2014 season, and he was spectacular. Darrell Wallace Jr. earned four victories in 2014; ending the year third in points for KBM. But his teammate Erik Jones, who turned 18 this year, raised plenty of eyebrows as he prepares to race full-time in 2015. Kyle (Busch) has really been a good friend and been able to provide me with a lot of advice not only on the racing side of things, but the mental side of things. 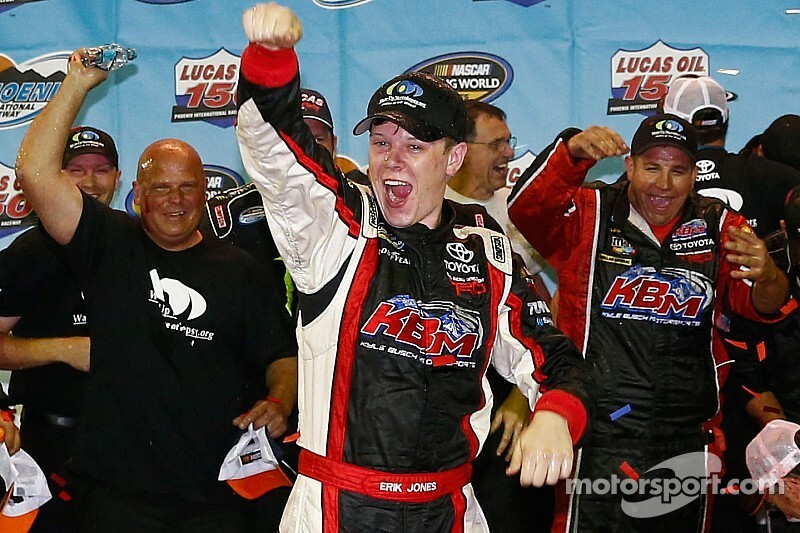 In 2015, Jones will be racing with KBM on a full-time basis. Besides his duties in the Truck Series, the Michigan-native is making a jump to the NASCAR Nationwide Series with Joe Gibbs Racing for a handful of events. After making three starts for the team in 2014, earning top-10s in each race, they have signed him to a multi-race deal. But in the Truck Series, he will have a new crew chief on the top of the pit box. Ryan “Rooty” Fugle is going to be reuniting with the young driver. 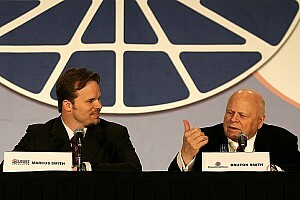 The pair worked together in 2013 for a handful of races, including Jones’ first career win at Phoenix, which made him the youngest winner in the division’s history at the time. However, the two were separated in 2014 when Eric Philips took the helm as his crew chief, while Fugle went back to being a race engineer. This change is one that excites Jones, who ran 12 races during the 2014 season with three victories. Although the two leaders have different personalities, their mentality over the course of a race weekend is nearly the same. In 21 races with KBM, Fugle has led his drivers to six victories, with an impressive average finish of 12.4. Formerly serving as Michael Annett’s crew chief in the Nationwide Series for Germain Racing, he has experienced the highs and lows of this sport. Even with plenty of success over the past two years, this young man still has plenty he wants to prove in this sport. Jones has had a very successful career at a very young age. While going to high school, he continued to chase his dream at an abundant rate. Sacrifices were made by he and his family in order to be as competitive as they could be on the weekends. Due to those sacrifices, as his high school career began to close, he started taking more online classes with his level of stress rising, along with his success behind the wheel. “I wasn’t able to graduate at home,” he explained. “The night of graduation, I was down in Texas. It’s great to have that support, and to know that everybody is there to help you out anytime you need it. It has been a really great time to get to know everybody in the industry, and I made a lot of new acquaintances. Following a multitude of triumphs in large events such as the Governor’s Cup 200 at New Smyrna Speedway and the Oktoberfest ASA Late Model race at LaCrosse Fairground Speedway, Jones started to get noticed. Yet no race was as bigger as the 2012 edition of the Snowball Derby at Five Flags Speedway, edging out Busch himself in the process. After that, the two built a bond and the Cup driver hired him to pilot one of his trucks. (Erik Jones) and I have raced together some, and he’s a phenomenal talent. I couldn’t be happier to work with him. Making his way up through the ranks at such a rapid rate is something Jones never thought of. Albeit he had plenty of success in Late Models, he said he didn’t think he would have worked up to highly respected divisions so quickly. However, that has made him become one of the top young drivers in the sport. Thanks to Busch and Gibbs, he’ll be racing at least 10 Nationwide races in 2015. Although he is unsure what races he will be running, Jones said he hopes that number expands, especially in 2016. By then, he believes he will be racing full-time in the Nationwide Series, and possibly be Wallace’s teammate, who will likely be joining their program this coming season. Until he makes that move on a full-time basis in NASCAR’s second-tier division, he’s going to have to contend for a championship first. The team assigned him to the No. 4 Toyota with “Rudy” Fugle as his crew chief. Fugle led KBM to six victories in 2013, and an owner’s title with the No. 51 team. KBM recently announced that Jones will be joined by ARCA Series two-time winner Justin Boston for their two full-time trucks. They will be adding a third one to the operation with Busch and Matt Tifft as well. Boston has raced in the ARCA Series for two years, and has competed with Jones and Tifft. Although he had his fair share of tough luck in 2014, the Maryland-native was one of the strongest full-time drivers throughout the year. Racing for Venturini Motorsports since 2013, he joins KBM with a prior relationship with Toyota, which is going to be key for his transition into the Truck Series. Originally, Boston was supposed to race the final three Truck Series races this year with Venturini after making his debut at Bristol in August. But after having discussions with KBM for a few months, his sponsor and he opted not to race the remaining events of 2014 following the completion of the ARCA season. 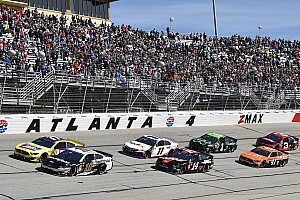 In two Nationwide Series events with Gibbs in the No. 20 car, he finished inside of the top-15 in both races, including a top-10 finish in his debut at Kentucky. Boston said he knew he could run well if everything went right, but he just wanted to learn and prove that he can run up front on a consistent basis. However, as for the Truck Series, he thinks Jones is going to be his toughest competition as they will both be fighting for the championship. Although Zloop, who backed Boston in the ARCA Series and in his limited NASCAR starts, is going to be on his KBM truck, the team is finalizing additional sponsorship before the season begins at Daytona. In 2015, he will pilot the No. 54 Toyota; formerly driven by Wallace. Shannon Rursch, who was a crew chief for Turner-Scott Motorsports in the Nationwide Series in 2014, will serve as Boston’s crew chief. As for the youngest member of the team, Tifft is going to be running six races in the No. 51 truck with Busch and Joe Gibbs Racing developmental driver Daniel Suarez. Although the majority of them will be companion events, he is looking to follow in Jones’ footsteps just like Boston. Following 10 ARCA Series events in 2014 with Ken Schrader Racing, Tifft ran inside of the top-five in half of those events, and likely would have contended for wins at Pocono and Kansas had it not been for some tough luck. Tifft ran three Truck Series races late in the year with BJ McLeod, and earned a top-10 in his debut with the team. Besides racing in ARCA and the Truck Series next year, he is studying at UNC Charlotte. 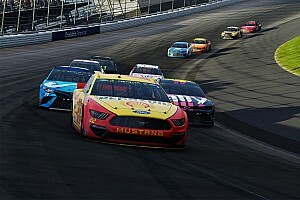 As the organization moves forward with their three young protégés, they will be looking to win another owner’s championship in 2015, along with their first driver’s title. The future is bright for this organization, and with the right chemistry between the three, Kyle Busch Motorsports will be on top once again.